Some people like their skateboards with a motor. A large wave of electric longboards has flooded the market and there are more coming each year. Manufacturers strive to innovate and add new features to conquer a share of customers and stay in the game. There are some really cool electric skateboards out there and some of them are quite ingeniously developed. If surfing the pavement in style seems attractive to you or if you just want to cut down on your commute time more efficiently, you will have plenty of excellent choices here in terms of cost-effectiveness. You might also be interested in our article about the best electric scooter. Before we look over the best electric skateboards that the market has to offer, let’s find out how do you go about purchasing one. What is essential to be aware of before you jump in and get a brand new motor-powered longboard? The answer to that is actually simpler than it seems. For many dedicated boarders, there’s nothing like the feeling of speed when you go down a hill or when you rush through the city, cruising around effortlessly. Speed is an important aspect for an electric skateboard and although it does depend on certain factors like weight or charge level, you should try to get one that’s fast enough to enjoy a comfortable ride. When the battery dies, the fun is pretty much over. Ideally, you should look for electric longboards that have a greater range, meaning that they can last for more miles on just a single charge. A smooth ride can make a huge difference in your enjoyment levels. The chances of injuries are also smaller. This is more difficult to figure out if you don’t test out the skateboard but there are some qualitative indicators of reliability that come into play that can help you make a better decision. When it comes to the build of the skateboard, you have to consider some aspects of its construction. There are some really performant products out there that may be lacking in build quality so it’s important to make the right assessment to see if the construction is cheap or durable. The remote, if one is included, should also feel quite responsive to command the longboard effectively. These are the essential aspects to look for when you’re on the hunt for a cool electric skateboard. Check out the great products in this article to be able to take your pick from the best products on the market. The Dual+ is part of the second generation of Boosted electric skateboards and represents a powerful combination of portability and speed to revolutionize the way you’re getting around. The reason why it is one of the top recommendations for an electric skateboard is that it offers an outstanding riding experience. It’s a very reliable product made of materials of the highest quality and it goes very fast for a considerably long time on a charge. If you’re looking for the ultimate board that money can buy, you’ve found it. With a top speed of 22mph, it will allow you to ride pretty fast and to climb hills with ease. The acceleration is very responsive and the board can smoothly take you up steep inclines. Thanks to the innovative regenerative braking system you can come to a stop with confidence even when you’re going fast down a hill. This electric skateboard makes use of a special belt drive system to magnify the torque of the motor and give you faster acceleration, stronger brakes, and better hill climbing capabilities. These belts are quiet and more precise than hub motors as you’ll be able to control the board much easier. What’s great about the Boosted Dual+ is that even if you lack the riding experience you can still use it comfortably thanks to the multiple ride modes. The first one is the beginner mode which only goes up to 11mph and after you get used to this you can work your way up all the way to the top level where you can ride at 22mph. All these controls are at your fingertips as the board includes a Bluetooth remote. An important aspect about any electric skateboard is the mile range. With the help of an extended battery, it achieves somewhere around 12 miles on a single charge which is pretty impressive. It’s an ideal vehicle for longer trips and the good news is that batteries are fully user replaceable. 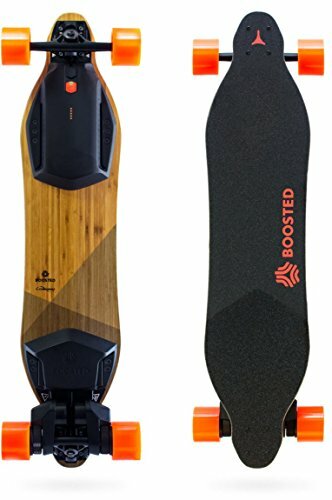 The quality of the Boosted’s construction is superb, the bamboo used for the deck providing a natural suspension and damping over bumpy roads. The flex of the board is clearly superior to decks that have only a bamboo veneer over a maple core. The last thing you need to know about the Boosted Dual+ is that it’s built to last for years and is designed to face even some unexpected potholes. With such a modular design, reparations can be done quickly to enjoy a reliable ride for longer. If you have the budget, this is the most premium electric skateboard to buy. 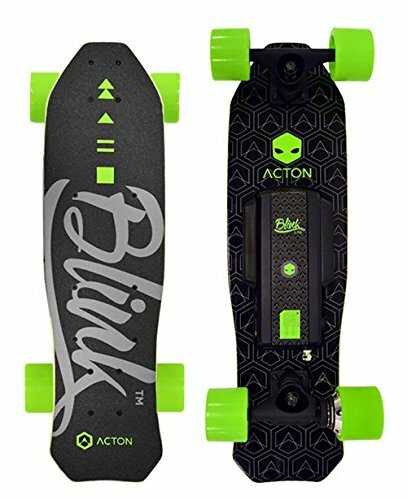 An extremely portable and fun board, the Acton Blink Lite is ideal for kids and teens and is considered the lightest electric skateboard in the world. It doesn’t go incredibly fast considering the top speed of 10mph, but it’s perfect for some light cruising and is very safe for kids. With 5 miles on a single charge, this electric vehicle seems like a good choice, especially when taking into account its affordable price. This motorized skateboard is very light, but don’t be deceived as Acton made no significant compromise on durability. The board still feels quite solid and sturdy, ready to withstand all kinds of urban adventures of your kids or teens. For ensuring the maximum level of safety, it comes equipped with LED lights which are highly visible in traffic and can even light the way for the rider to better see the obstacles on the road. One aspect where many electric vehicles fall short is the battery. Acton implemented good quality lithium-ion batteries which charge fully in only 2 hours. For average riding, it should last somewhere around 5 miles which is decent for this price level. If the battery dies, no worries because you can simply use it like a normal one. In the kit for this electric shortboard, Acton added a very simple-to-use wireless remote to have the controls of the vehicle right at your fingertips. With a single press of a button, you can accelerate, brake or go in reverse. Thanks to the dedicated smartphone app, you’re able to track all kinds of interesting metrics like the number of miles and your routes. Blink Lite’s single hub motor offers some good power to get around but the main advantage of its design is the reliability and how easy it is to maintain. 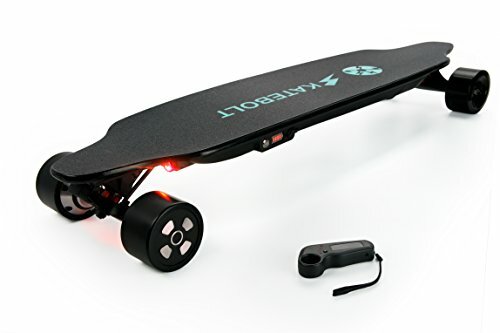 The regenerative braking feature is also included for this electric skateboard and it allows for your battery to create and store some extra energy when you brake. All things considered, the Acton Blink Lite will amaze you with its low weight and powerful features. If you want a great entertaining way for your kid or teen to get around the neighborhood, this is one of the best options. 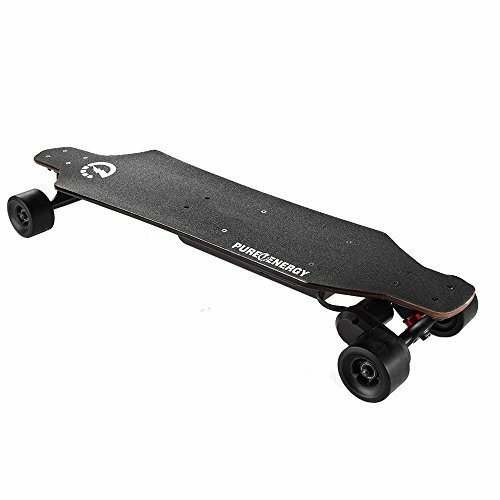 It’s a well-made and capable electric skateboard at a reasonable price. With a top speed of almost 25mph, the Skatebolt (second generation) electric skateboard is the perfect board for those who value going as fast as possible over everything else. The included battery is pretty big, providing up to 15.5 miles of range on a single charge. There are many cool abilities of this unit and the price is not so high for what it offers. The strongest point of the Skatebolt is the performance which is really amazing as the board uses a dual 90mm brushless 1000w motor. This turns the skateboard into an electric powerhouse capable of reaching consistent speeds above 20mph and can climb hills with a maximum angle of 25°. It’s difficult to figure out exactly what speed you can reach as there are some factors like the user’s weight and road conditions that have an influence on performance. The point is that it’s a very fast electric skateboard that can significantly cut down your commute time. The deck is made of Canadian maple with 9 layers and can support a maximum load of 280lbs. With a good level of hardness and built to resist heavy usage, the 53 mm PU wheels are of decent quality. Regenerative braking is another integrated feature to regain some energy back from braking. Another solid aspect of this board is the battery which has a nice 6600 mAh capacity and requires 2-4 hours for a full charge. It also powers two lights, one in the front and a rear one to safely ride at night. The wireless remote control could be considered a bit of a weak point as it’s made of flimsy plastic and it feels quite cheap. It’s a bit obvious that the manufacturer made a compromise on quality for the remote but this is not a big inconvenience. The real fun is the electric skateboard which offers a very pleasant riding experience. Some people might prefer a belt driven alternative, but very few probably think that it’s worth all that extra money unless you have many steep hills on your commute. At this price point, the Skatebolt is an absolute best buy. In terms of performance per cost, it’s pretty much a great pick. It may not be perfect but you can rest assured that you spent your money well. Many people are getting tired of inefficient ways of travel and getting stuck in travel and it’s pretty clear that an electric skateboard like the MaxFind is a highly portable and low-cost way to take care of your commute. At a very balanced price, it will offer a safe and comfortable ride experience and can be taken pretty much anywhere with ease. A stylish looking board, it is made of Canadian maple and provides a good flex to increase stability at high speeds. Durability hasn’t been overlooked either especially when you take into account the strong grip-ability of the wheels. The board weighs just 12lbs making it a very portable vehicle suitable for teens and adults alike. The deck is strong enough to handle maximum weights of 220lbs. A nice extra is the IP65 waterproof ability that enables you to ride it during rainy conditions. Regenerative braking is another feature worth mentioning which can save some energy in the long run. This electric skateboard is not that speed-oriented as it only reaches top speeds of up to 17mph. The strength of the MaxFind lies in the safety department as it seems the manufacturer designed the board to ensure a low risk of injury or accidents. A good move in that direction was the added red LED in the back of the board and a white one in the front for simple identification at night. The Samsung batteries are user replaceable and provide a solid level of safety thanks to the certified battery cells and the UL CE adaptor. With 10 miles of range, it is a good option for longer rides. As a bonus, you can take this electric skateboard on a plane as it’s fully certified for airline travel. Considered one of the most portable electric longboards out there, the MaxFind is a quality motorized vehicle that’s sure to captivate your attention with its impressive arsenal of features. If you want a quality electric skateboard in all regards, this has great potential as it’s very safe to ride, easy to master and lasts for a good time to enjoy riding in style with minimal effort. 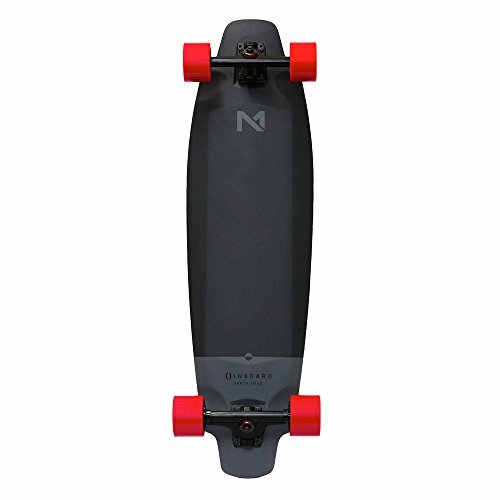 If you have a solid budget and want to buy a premium electric skateboard and don’t waste your money on cheap stuff, the Inboard M1 is an excellent choice. With a state of the art design, a powerful combination of in-wheel motors, a battery swappable in seconds and incorporated LED lights, this is the electric vehicle you’ve been waiting for to completely transform your urban commute. The deck of the M1 is one of the most advanced you can find as it was custom designed combining an inverted 3D Poplar wood core with ABS sidewalls. Borrowing from premium snowboards and skis, Inboard integrated a fiberglass top sheet to wrap everything up. This is a platform created with durability in mind as it has reinforced truck mounting points. A strong contribution is made by the tail bumpers which yield a surprisingly robust platform optimized to offer a more responsive ride. This electric skateboard makes use of a PowerShift battery that’s promising a quick swapping experience and a solid range of 7 to 10 miles depending on certain conditions like the user’s weight and the quality of the road. In terms of power, it seems like it can pack quite a punch as it’s able to reach top speeds of 22mph. It uses the Manta Drive technology which doesn’t use gearing or belts. You can accelerate smoothly without experiencing any resistance to the wheel enabling the board to glide like a regular skateboard. The regenerative breaking makes you feel more secure and comes with the added advantage of energy efficiency. Something that also captures the attention is the RFLX remote used for wirelessly controlling the electric skateboard. It’s designed to fit very nicely in your hand and stay tightly even if your palm is open. You can focus on the ride with ease thanks to the intuitive controls. Speaking of control, the Inboard Vision mobile app puts you in charge of Inboard’s ecosystem where you can adjust various settings and see the battery level. Considering everything about the Inboard M1, its innovative features and the incredible performance it provides, the verdict is clear. This is one of the best electric skateboards that money can buy. It’s a bit pricey but to be honest it would be a much better investment to save some more for this one rather than buy a cheaper model if you want a truly quality riding experience. For those looking for a vehicle that’s better suited for rougher terrain, the MotoTec MT-SKT-1600 is the best choice. 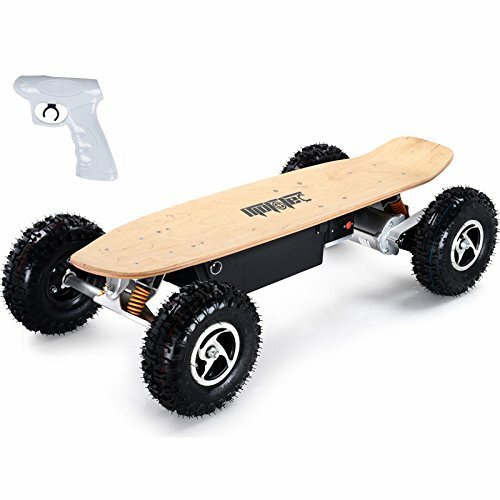 It’s a dirt electric skateboard which comes with two separate motors, one on each rear wheel for allowing the board to turn but not to twist during acceleration. This setup is also optimized for getting better traction on dirt. The price might seem high but the performance and reliability of this board can easily justify it. The first feature worth talking about is the construction of this board. The deck is made of real wood and has specially designed trucks and quality spring bushings. It’s perched on thick, deeply-treaded tires which are capable of gripping both dirt and concrete equally well. The skateboard should be able to support up to 260lbs. The dual motors of the which total an impressive power of 1600W are made for performance as the skateboard can reach a top speed of 22mph. You can benefit from this speed for approximately 90 minutes on a single charge of the lithium-ion batteries. They should take about 3-5 hours to charge completely and if you want to check the current battery level, MotoTec integrated an easy to read on-board LED indicator. To control it you get a handy remote that works wirelessly. You can switch it up however you like it as the variable throttle puts you in control of how fast or slow you’re going. Stopping can be done very safely thanks to the integrated anti-lock braking system. Speaking of safety, considering the high speeds that this unit can reach, it can be pretty dangerous to use it on offroad dirt tracks so make sure you always wear the best protective gear. Combining the intensity of extreme sports with the fun of skateboarding, the MotoTec delivers a superb power boarding experience. Everything, from the large treaded-tires to the fast acceleration and the durable construction seem to be ingredients for a very high-quality electric vehicle. If you want a good dirt motorized skateboard that’s worth the money, don’t hesitate to check this one out. 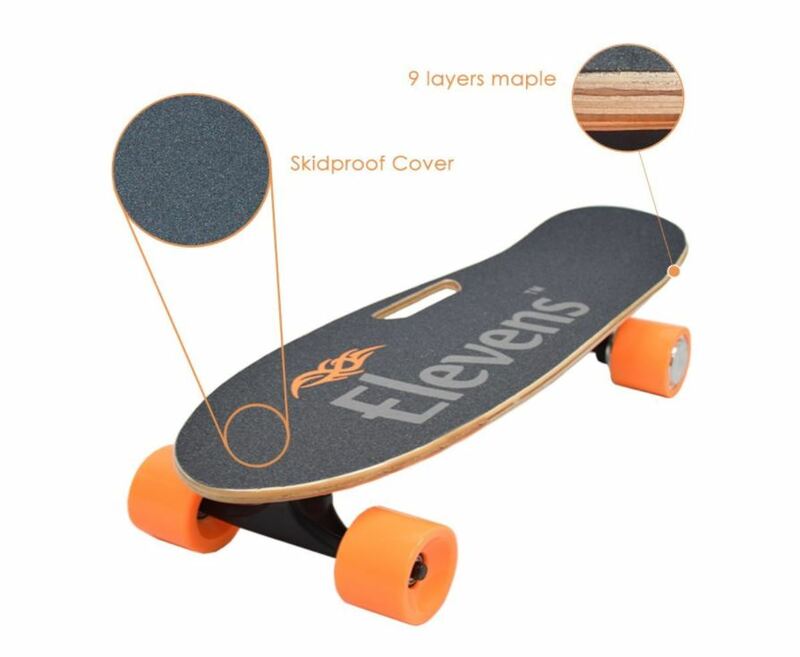 A good start point for those who wish to try out an electric skateboard is this one from Elevens. It comes with some basic features including a top speed of only 12mph but if you want a budget board, it’s pretty much the best choice for the money. It is powered by a 120-watt hub motor that won’t go very fast but it’s still able to climb 10-15 grade hills without too much effort. It comes to a stop quickly thanks to regenerative braking which increases the overall energy efficiency of the vehicle. Controlling is done through the usual remote control that we’ve grown accustomed to for electric skateboards. It’s ergonomically designed to fit nicely in the palm of your hand and to act as a secure link between the user and the board. The 2200 mAh lithium-ion battery doesn’t impress anyone with its capacity but considering the motor which will not consume too much power, the Elevens electric longboard can easily reach 10-12 miles before the battery dies and needs a recharge. It’s worth mentioning that this battery is patented with the Sentry Shield technology which adds extra security as it provides multi-layered protection for your battery. Made of 9 layers of hard Canadian maple, this longboard delivers a solid and sturdy riding experience. Nothing that really stands out but it feels surprisingly durable for what you pay for. No complaints here, as the board is also suitable for rougher terrains. There’s hardly anything else to say about this board. For a low-cost electric skateboard, it does a solid job. You can zigzag through traffic and ride away in style with minimal effort. 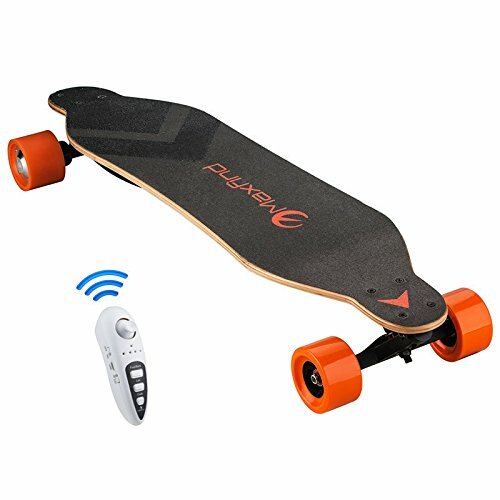 This is a recommended product if you don’t want to spend a fortune on an electric skateboard but you still want a decent level of quality and reliability. The Ampere comes equipped with the latest technology as it’s smartly combining impressive durability with efficient portability making it one of the best selections for an electric skateboard. Created for the purpose of simplifying the user’s commute, the Ampere will make you forget the days when you were stuck in traffic. This longboard is built with lightness in mind but without sacrificing durability. With a neat case design that combines tough ABS plastic and aluminum, the Ampere provides superior protection to all the essential components. It is powered by a brushless motor which will help it reach speeds of 21mph and it makes it possible for the board to tackle hills. There are loads of fun ways to enjoy this electric skateboard including free-riding and getting somewhere where you need to be quickly and efficiently. The battery is one of the most striking features of the Ampere. It boasts a huge range of 18-20 miles per charge which turns this electric skateboard into an ideal vehicle even for longer rides. It’s always nice to be able to have fun with the board without worrying about constantly having to be near an outlet. A good feature to have for any electric longboard is the regenerative braking that converts the kinetic energy from the braking into new energy that can be stored right back into your battery. The controller is also one of the highlights of the board as it’s custom designed and developed for getting the maximum level of performance from the motor and the best protection for the battery and the other electronics. Taking into account the exceptional battery life and the superb performance, the Pure Energy Ampere could be a solid alternative to some of the more expensive electric skateboards on the market. Easy to ride and built to last, this motorized longboard is highly recommended to anyone, beginner or pro, to have a blast flying down the streets navigating with style.